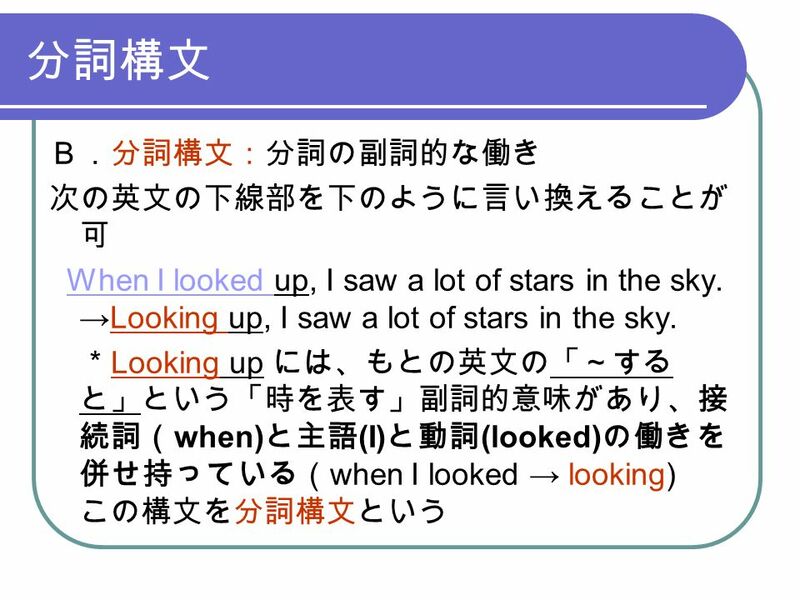 1 分詞 ＊スライドショウを実行し、左クリック（一回）で改行しながら読み進めて下さ い 分詞の形は？ ①現在分詞 ・・・《動詞原形 + ing 》 sleep →sleeping, take →taking, run →running ②過去分詞 ・・・２種類あります (1) 規則変化をするもの ・・・ 《動詞原形 + ed 》 boil → boiled, close → closed study → studied etc. 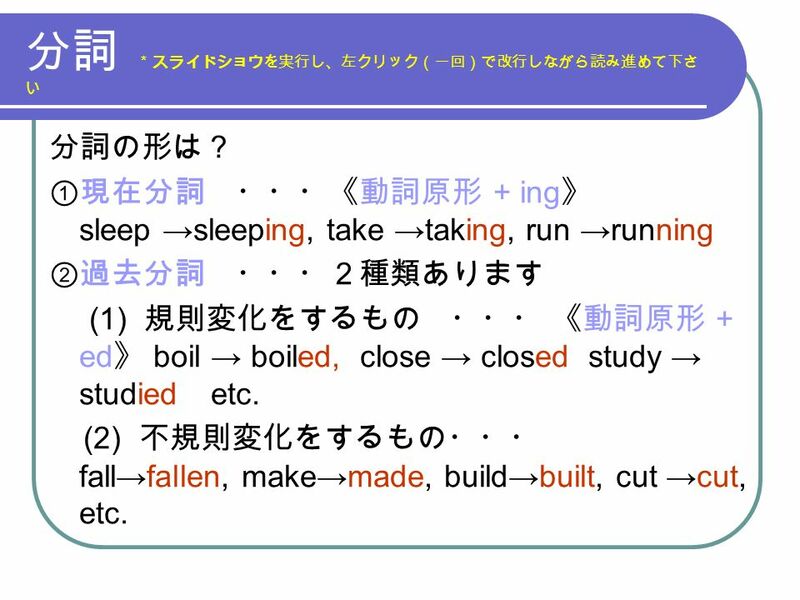 (2) 不規則変化をするもの・・・ fall→fallen, make→made, build→built, cut →cut, etc. 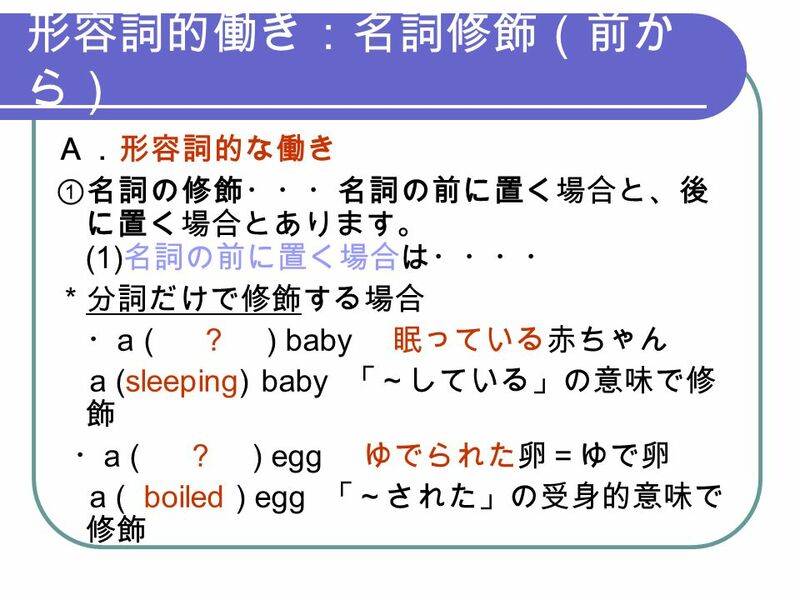 6 主格補語 主格補語の用例： ・ The baby kept ( ? ) all night. 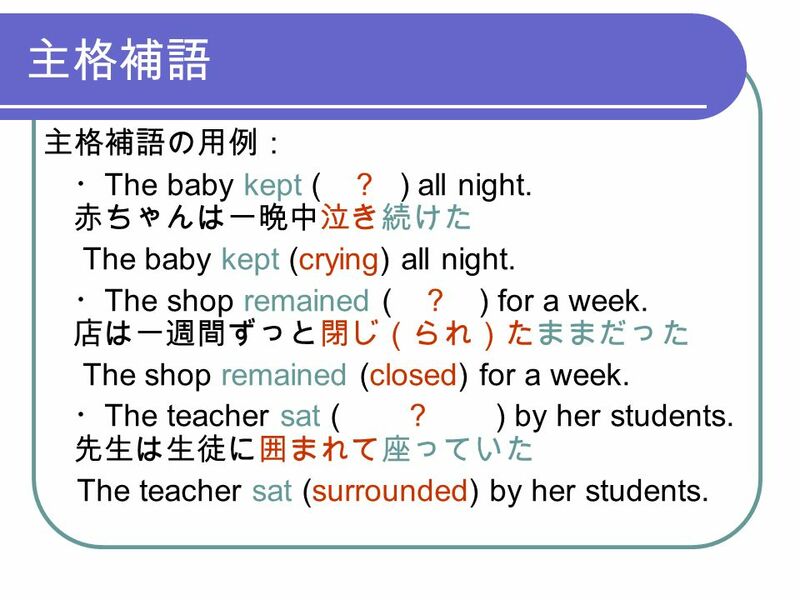 赤ちゃんは一晩中泣き続けた The baby kept (crying) all night. 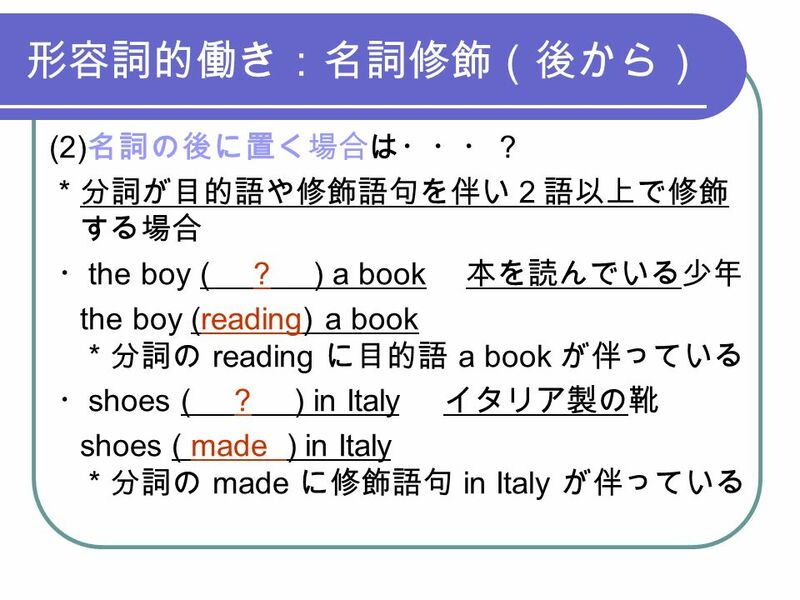 ・ The shop remained ( ? ) for a week. 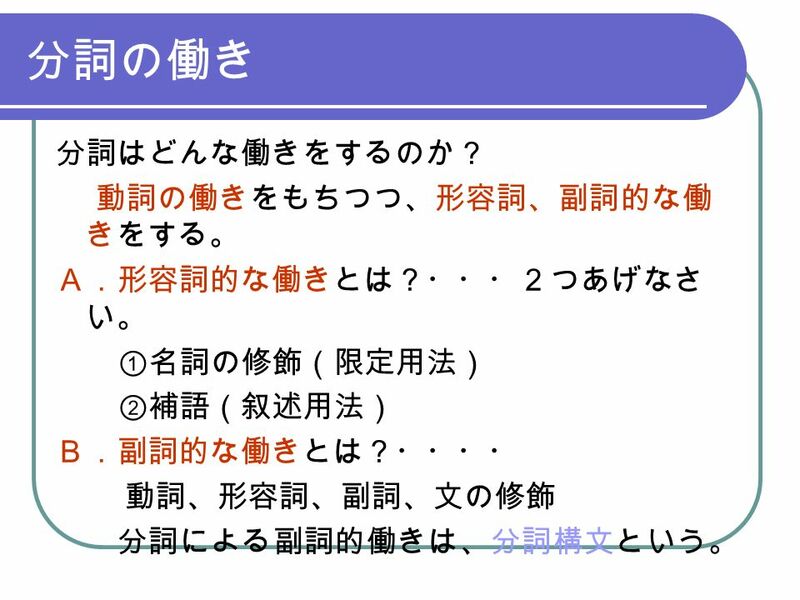 店は一週間ずっと閉じ（られ）たままだった The shop remained (closed) for a week. 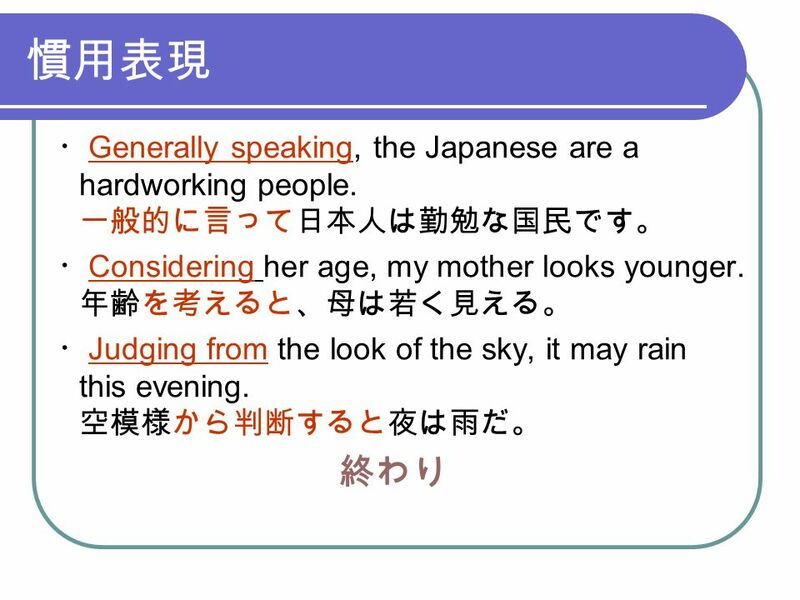 ・ The teacher sat ( ? ) 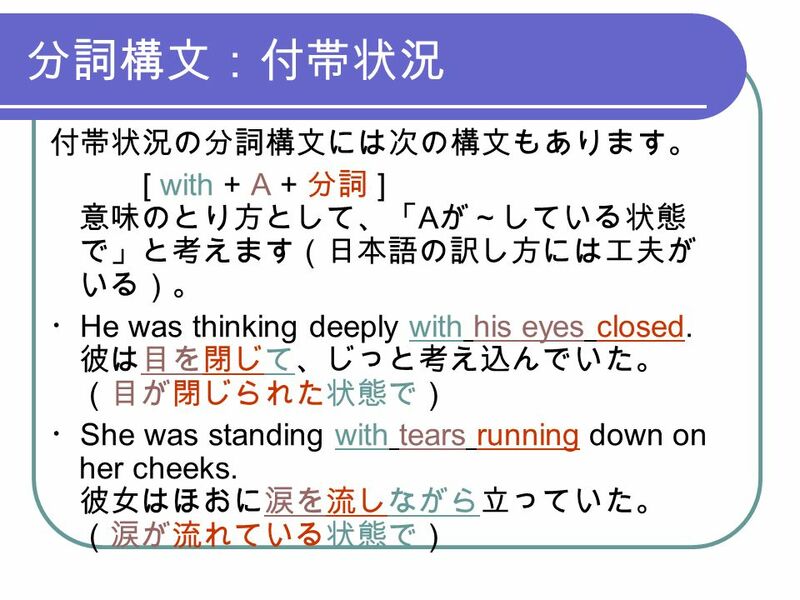 by her students. 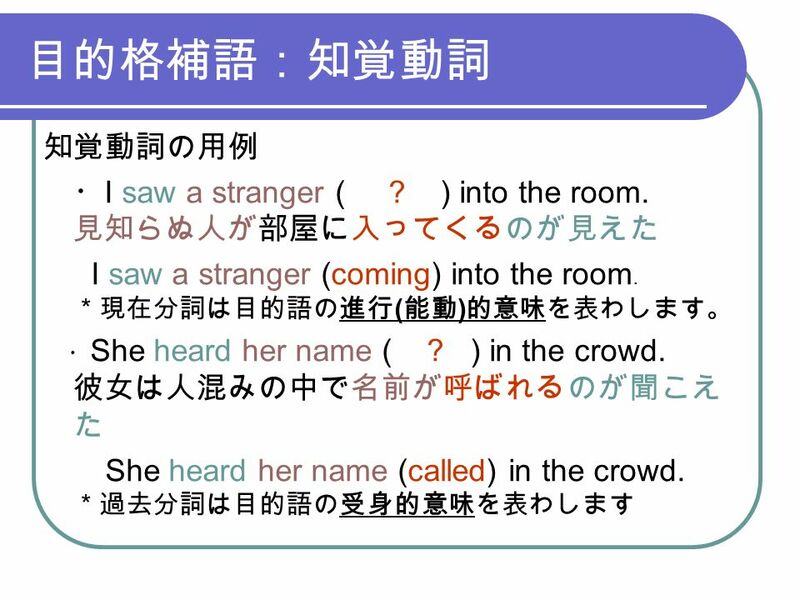 先生は生徒に囲まれて座っていた The teacher sat (surrounded) by her students. 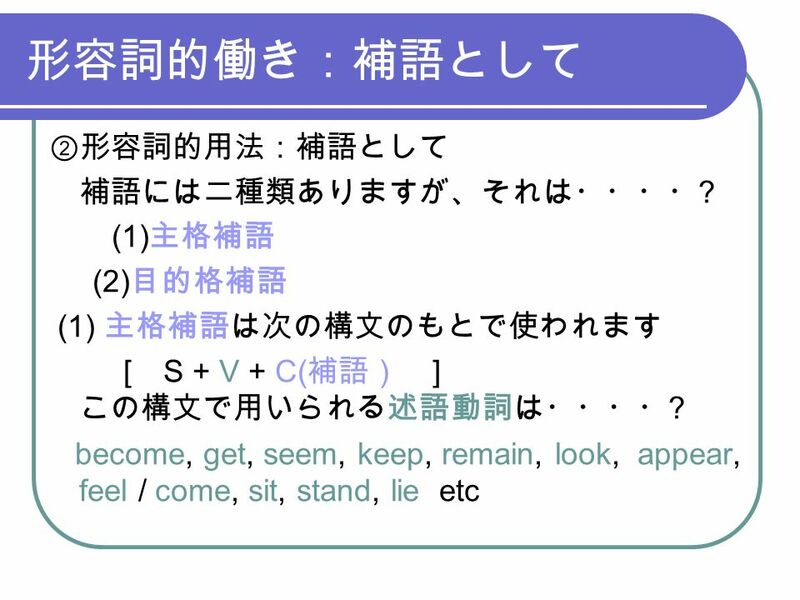 9 目的格補語：使役動詞 使役動詞の用例 ・ Can you make yourself ( ? ) 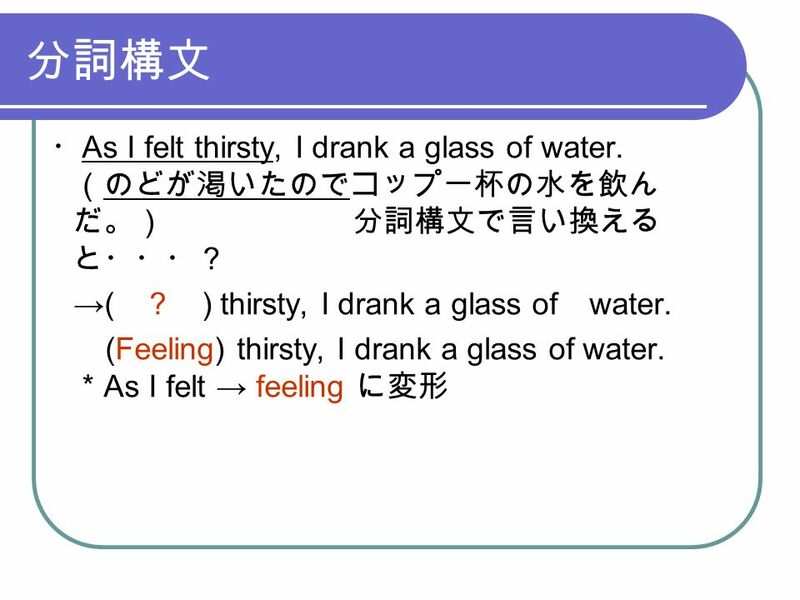 in English? 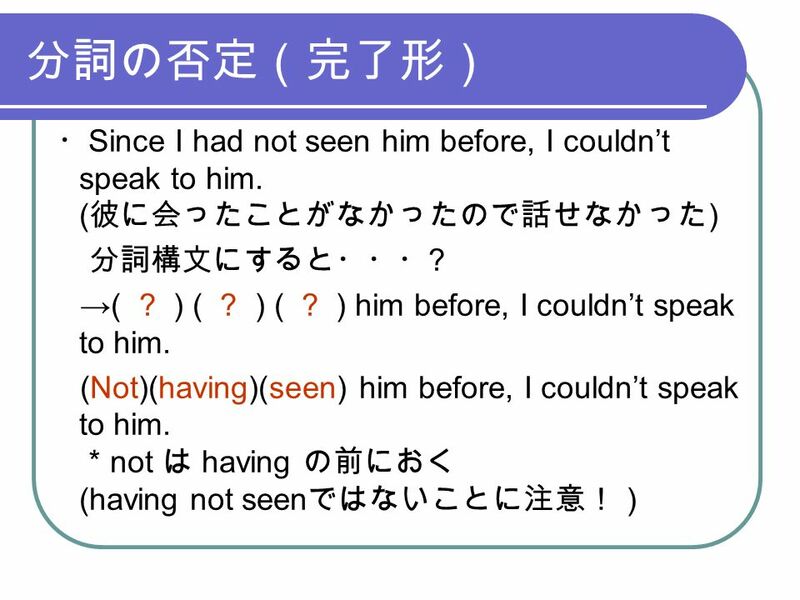 あなたは自分自身を英語で理解し（さ れ）てもらえますか（あなたの英語は通じます か）？ Can you make yourself (understood) in English? ・ It’s time for you to have(get) your hair ( ? ). 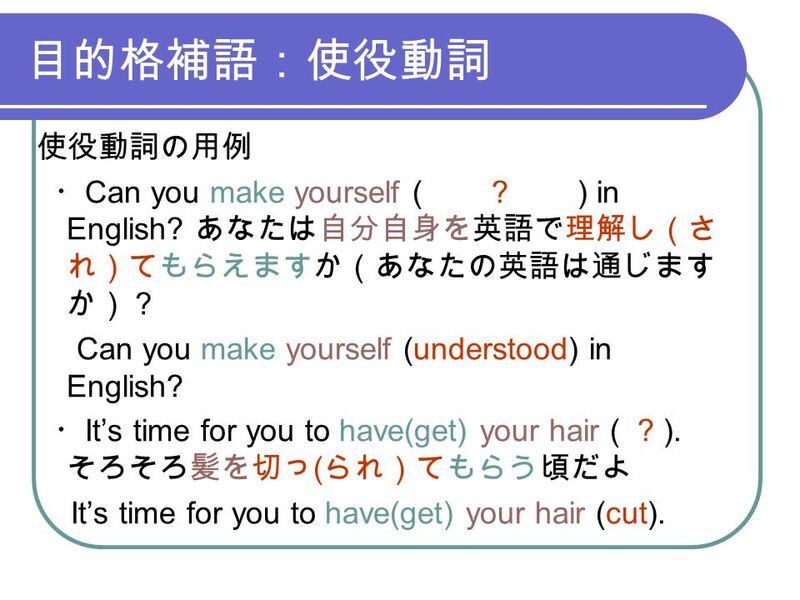 そろそろ髪を切っ ( られ）てもらう頃だよ It’s time for you to have(get) your hair (cut). 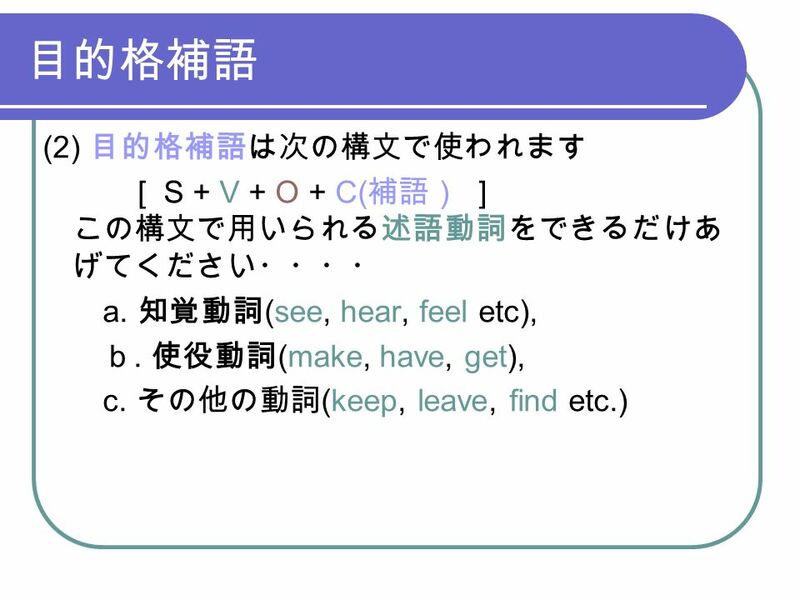 10 目的格補語：その他の動詞 その他の動詞 ・ You mustn’t leave the water ( ? ). 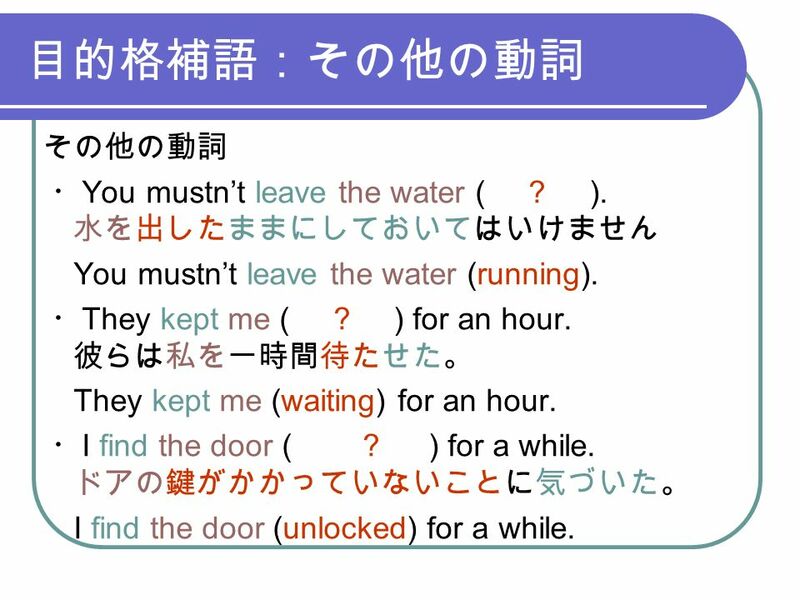 水を出したままにしておいてはいけません You mustn’t leave the water (running). ・ They kept me ( ? ) for an hour. 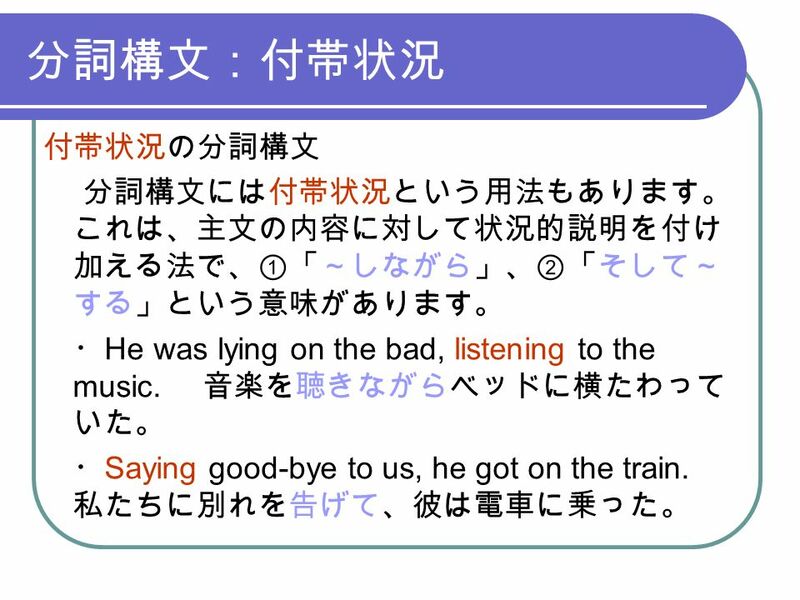 彼らは私を一時間待たせた。 They kept me (waiting) for an hour. ・ I find the door ( ? ) for a while. ドアの鍵がかかっていないことに気づいた。 I find the door (unlocked) for a while. 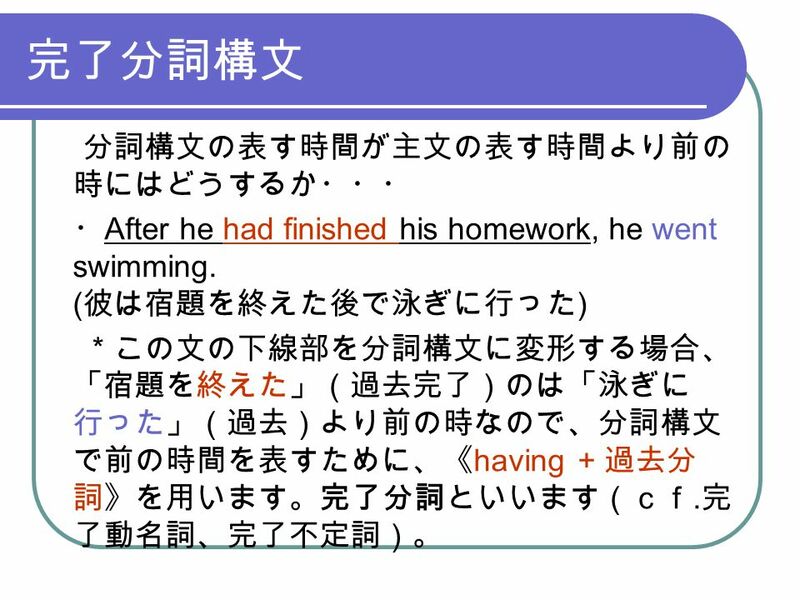 17 完了分詞構文 次の文を分詞構文で表現すると ・ After he had finished his homework, he went swimming. 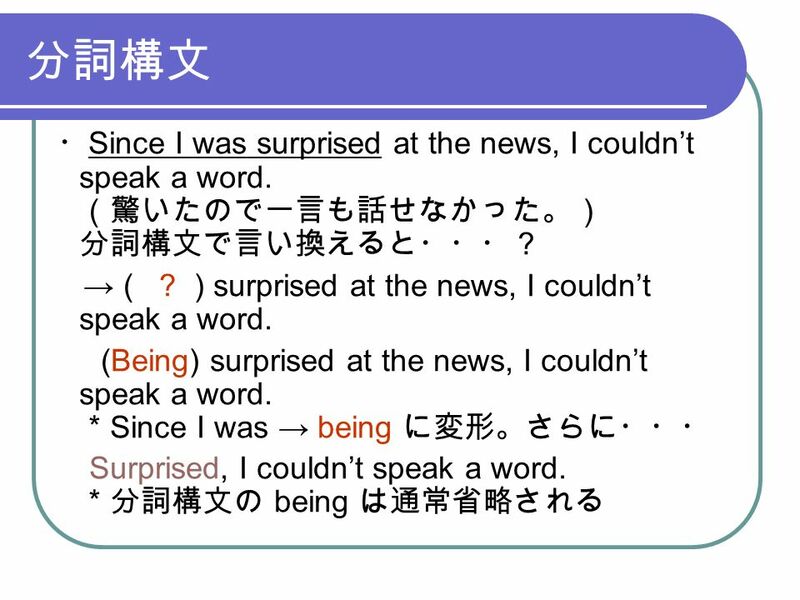 → ( ? )( ? ) 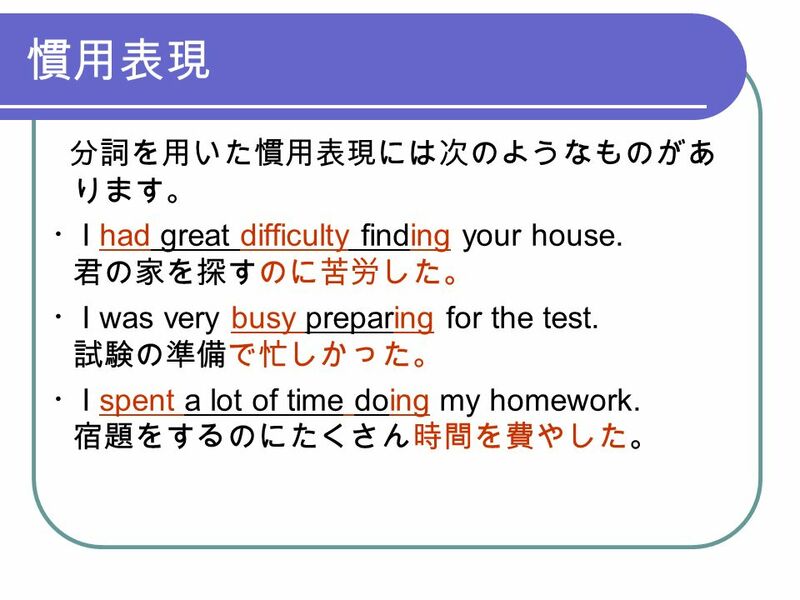 his homework, he went swimming. 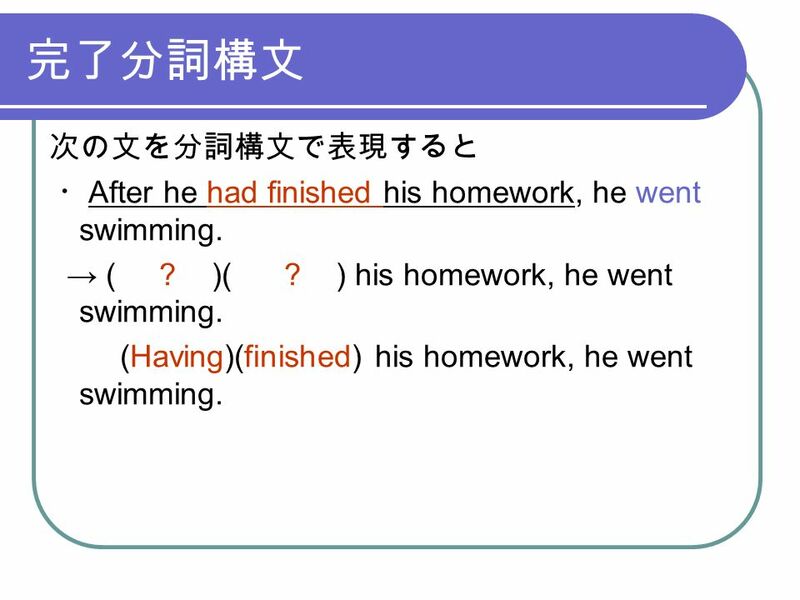 (Having)(finished) his homework, he went swimming. 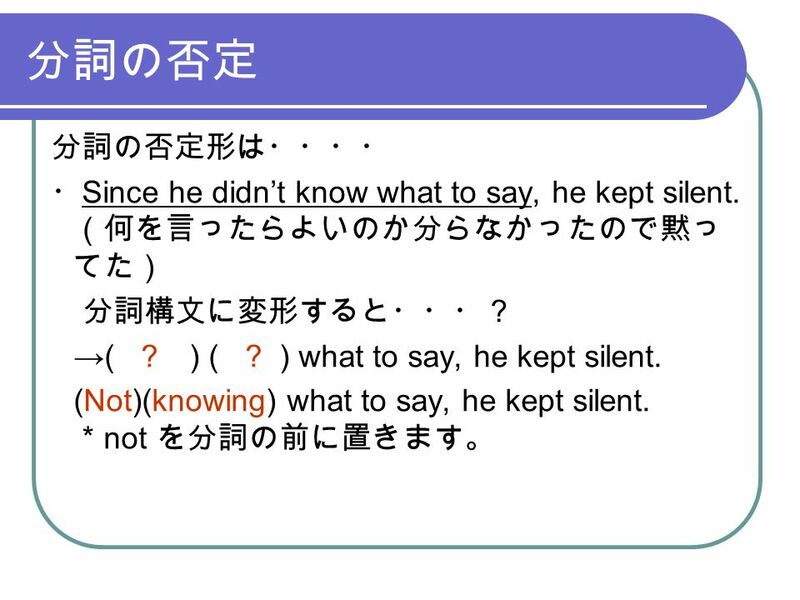 Download ppt "分詞 ＊スライドショウを実行し、左クリック（一回）で改行しながら読み進めて下さ い 分詞の形は？ ①現在分詞 ・・・《動詞原形 + ing 》 sleep →sleeping, take →taking, run →running ②過去分詞 ・・・２種類あります (1) 規則変化をするもの ・・・"
Dont’ Ask Me That Question!